Little ones find it easy to talk to God, but they might not always know what to say. This Little Prayer of Mine gives them some ideas in rhyming verse. This simple children’s prayer asks God for help when they feel scared, a smile when sad, wisdom and direction in making decisions, forgiveness for bad behavior, and comfort when feeling lonely. They also thank God for the good things in life and ask for the desire to share their good fortune with others. While it’s good to learn formal prayers, children can also simply pray from the heart, turning to God as a father and a source of never-ending love. 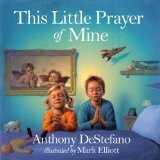 This sweet prayer book would be nice to read at bedtime.